If you’ve ever asked Access to do a join between a local Access table and SQL Server table (which is called a heterogeneous join) you may have experienced first hand how slow it can be to process results. The situation could be vastly superior if you can afford to download the SQL table as a temporary table to your Access front-end and then process the join. This post will provide you with an easy solution to download SQL Server data into Access using a subroutine you can call from code. 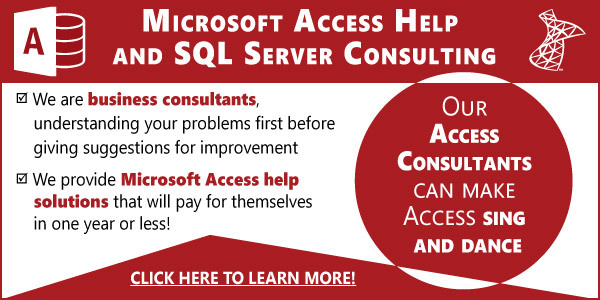 There is no direct way to download SQL Server data into Access using code, you can’t use a ADODB recordset or command to download the data, since they only “see” the SQL Server side and don’t have exposure to your Access data. The technique I’m providing here will use a temporary pass-through query, then using it with a make table query to create the local Access table copy of your SQL data. 200 MsgBox "Table " &amp; strTable &amp; " is ready for export to Excel"
204 FollowHyperlink strFile &amp; ".xlsx"
270 MsgBox Err.Description, vbInformation, "Error"
strSQL: SQL statement used to retrieve data from SQL server. You can therefore extract multi-table joins into a local Access table. CreateLocalSQLTable "tblCustomers_SQL", "Select * from tblCustomers"
Notice how I appended the _SQL to my local Access table name. I will later delete all _SQL tables on program exit. In the second example the code will also launch Excel with the extracted data, allowing my customer easy Access to data from SQL Server without the use of ODBC in Excel. Once you’ve downloaded the data you may have a need to add indexes or primary keys to your local copy of the table, click here for a post that will walk you through that using Alter SQL commands in Access. 30 DoCmd.DeleteObject acTable, strTable &amp; "_SQL"
") in procedure CopyTableLocally of Module mdlGeneral"
Don’t download too much data. There’s a good reason your data is on SQL Server. Pulling large amount of data only eats up network traffic and may cause contention issues or even deadlocks. I usually use this technique for small reference tables that I later use in a all local joins. If your data is small and the data rarely changes in the table you’re downloading then this code is for you. Beware of file bloating: Ideally you should keep your temp tables in a separate Access file, otherwise your front-end may start getting pretty large and require frequent compacting to slim it back down. Great info – I devour your writes and articles – however they often [and by design] create more questions than they solve – but that is what learning about. What I find difficult is when to link or not to link – when to import to local – or when to use SP. However, on top of this is a pure design [or good programming technique] learnt the hard way – ie ODBC linked tables MAKE LIFE EASY – and make use of DAO [which has made a resurgence in 2013] – just easy to use as the linked table just becomes part of Access without thinking about the network aspects. However one major disadvantage is break the link and your queries tumble. Recently I created a program solution frontend Access – backend giant SQL Server 2012 – which [I wasn’t told ] was somewhere out there on the network – ODBC links worked well – all worked well – and makes it easy via DAO to view, edit,update – however – once you go realtime this network linkage created a real lag in the package. New records were however created via ADO – open connection – addnew – close. View, edut/Update was DAO. And then there is a problem that when you open an ADO OLE connection to an SQL dbase table – and you create a Rst – it isn’t then easy to put that data into a local table without a recursive loop. Question 2. Your comments on using linked tables in queries -and how do you not do this except by copying data to a local table. Question 4 – or is it better to create views in SQL – link to those via ADO – and so longas these views aren’t too complex [making them read only] edit/update can occur. Your code works well for queries selecting tables and SQL views, but obviously I can’t use it to get data from a parameterized SQL UDF or SP. My desire is to populate the temp table in Access, and then use the temp table as the record source for my Access report. Question #1 – Is this the best approach to populate my Access report from SQL data? Question #2 – How would I best populate an Access “temp” table from a SQL stored procedure using Access VBA? “Exec usp_Dashboard ’12/31/14′” — Notice the single quotes around the date. I have not tested a UDF but it should work as well. Thanks a lot of this example… I have been looking for a way to do exactly this.. I had tried using passthrough query, but even that was really slow, but this is excellent. Cut the speed by almost Half. I have a question. In this sort of scenario – one where I wanted a temporary table, but one which may have relationships to other tables – I’ve always been likely to do the work in two steps. Firstly a DDL SQL statement to create the table , along with its contraints, indexes and foreign keys. Then secondly, a straightforward DML statement to append the data into that table. I’m certain that in fact this is simply down to “the way I’ve always done it” – but I suppose I’ve also instinctively felt that creating the indexes etc on an empty table and then appending data would be faster than using an ALTER TABLE command once the data already resides there. Do you have any thoughts on whether one way or other is likely to yield a performance benefit? Thanks for a thought-provoking read! Thanks for sharing your technique! I can’t tell you for sure if doing the indexes first and then filling the table with data is faster but your approach does require more discipline. Sometimes a temp table is the derivative of a multi-join query, so I commend you in taking the time to create the table first, I for one use the INTO statement and then ALTER but each of us has our preferences! N-tiered architecture in general depends on having a middleware… this could be a web server, a DLL or something similar sitting between the client and the database server. As such, you wouldn’t use ODBC, OLEDB or similar technologies when you build a middleware but rather implement the functionality in forms of web services using protocols like SOAP or REST or a properitiary interface which the client must support in order to connect to the middleware. N-tiered architecture is a wonderful when you have a need to support multiple numbers of architectures (think of FaceBook or Twitter – they need/want clients running on not just Windows, but also Mac OS X, iOS, Windows phone, Android… list goes on). I hope that help. If you need assistance building a solution that would enable Access to participate in a n-tiered architecture, feel free to make use of our consulting service and call us at 773.809.5456. Hi! good day Juan, I would like to ask about N-Tier Architecture. 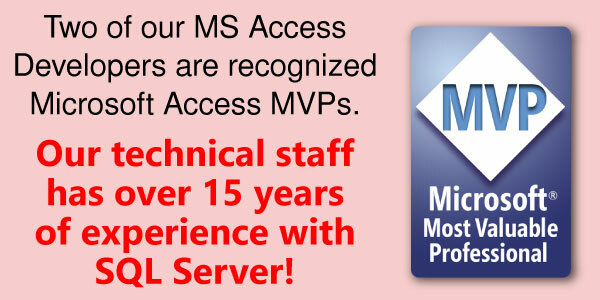 A SQLserver in a server accessed by a client pc with ms access or vb frontend is a client server model or 2-tier. What if both SQLserver and client frontend was installed in the same server but a terminal server and accessed by the client using remoteApp or remote Desktop? still a 2-tier or 1-tier model? 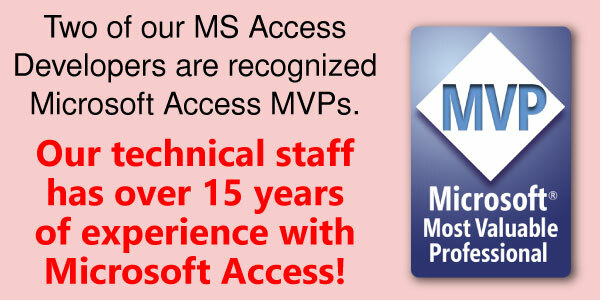 is it possible to implement a 3-Tier model in ms access a.k.a MVC? . I’m also an access die hard but instead of using sqlserver as a backend, I find mySQL and Firebird more compatible with access (that is my own observation- migration and conversion is very straight forward and I dont have to worry even with the boolean Y/N field in access). Thanks and more power to you. Great questions! Yes, it’s still a two tier model regardless if it’s via RDC, WAN or Local network. I’m not sure what MVC is, perhaps you can elaborate? Access Web Services running on IPad or other web device.